We get loads of emails about new themes to review and feature in the blogs, and we try out best to pick out the coolest and most unique. I had no trouble at all picking this one as it is the first of its kind, and one of the coolest themes I've ever seen. 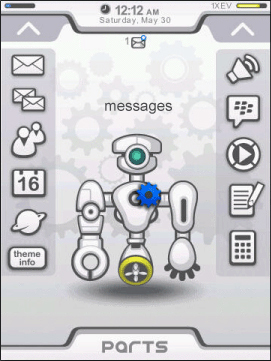 Robotika is a premium theme for the BlackBerry Storm 9500 & 9530 that allows you to create your own robot on the homescreen based on your customized application icons. Depending on what you select for your top applications, your little robot friend is customized accordingly with a head, arms and legs. This is truly a unique feature and will keep this theme totally fesh for a long time. 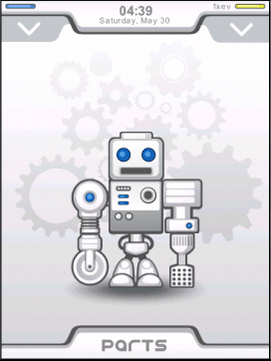 Robotika also features two drop down menus with a variety of quick links. If you're a Storm owner, you should absolutely check out Robotika. Available OTA from your device at CrackberryAppStore.com at the special price of $2.95 (regularly $4.95) through Sunday June 7th (no coupon code required).